Update 17/03/2010 1940hrs the competition is closed and the results have been drawn. The winner has been emailed today and we now await their reply so that their prize can be sent out to them. "MULTICAM Blackhawk Battle Bag", "MULTICAM Blackhawk Grab-to-Go Bag" – call it what you will, but you need one. Organise all of your w_________ n_______ in this over-the-shoulder MULTICAM Blackhawk carry bag. 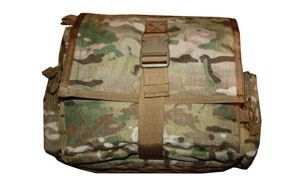 MULTICAM Blackhawk Battle Bag will hold everything from comms, chem. lights, concealed handgun, spare magazines, maps, GPS – all have a place in this bag to enhance your survivability. The email must be sent to bag_competition@arniesairsoft.co.uk from your registered forum email address. Please include your real name and registered forum username in the body of your email. The competition closes on 14th March 2010 at midnight GMT. Winners will be announced on Monday 15th March 2010. Winners will be contacted by the email address provided on their submission email. The winner’s forum nickname and first name will be announced on the front news page and on this competition page. The winner will be asked by email from ArniesAirsoft to provide their contact address, phone number. The winner’s details will then be passed to Intelligent Armour solely for shipment purposes (this will include, name, email address, contact details and confirmation of forum username). The selected winner will have one week to reply to their winning email after which a new random winner will be selected. The winners details will be passed to Intelligent Armour and the prize will be shipped direct from them. The competition is only open to registered forum members of arniesairsoft.co.uk (you must be registered in our forums). The winner will be randomly selected from correct answers and notified by email. The winner will be selected by staff at ArniesAirsoft, our selection will be final. The competition is not open to forum/website staff. The competition is open to both UK and International based readers. The winner will be liable for any local import taxes and fees. Duplicate entries will be removed and void all relevant submissions from that individual. By entering you agree to these terms and conditions. ArniesAirsoft and Intelligent Armour shall under no circumstances be held liable for any loss or damage in any form.